As part of the Banaue Rice Terraces of the Philippines Cordilleras, the Batad rice terraces are thus also a UNESCO World Heritage Site. Known as the "Eighth Wonder of the World" by the Philippines, they are one of the most well-known attractions of northern Philippines. 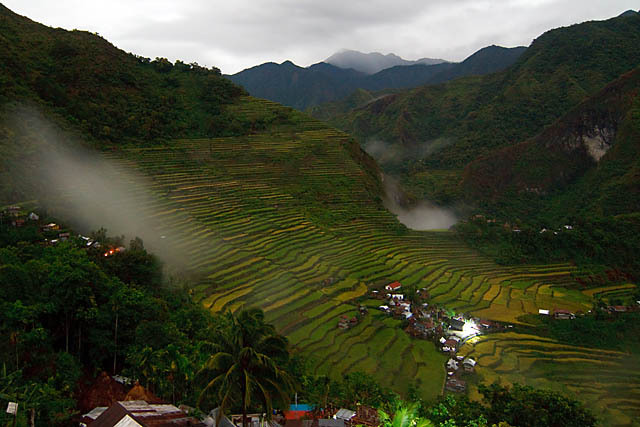 Situated in the Ifugao province, the Batad rice terraces rises up to the mountains like an amphitheatre draped in green. It is certainly one of the more spectacular of the rice terraces in the region. 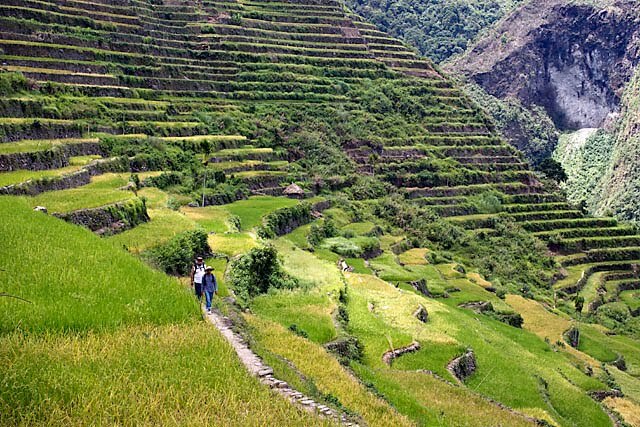 These rice terraces are created and passed down almost 2000 years ago by the Ifugao tribemen, who are believed to be descendents of Miao people from southwest China. While most tourists take a day trip from Banaue town to see the terraces, I highly recommend staying a night or two in Batad itself to fully enjoy this wonder. 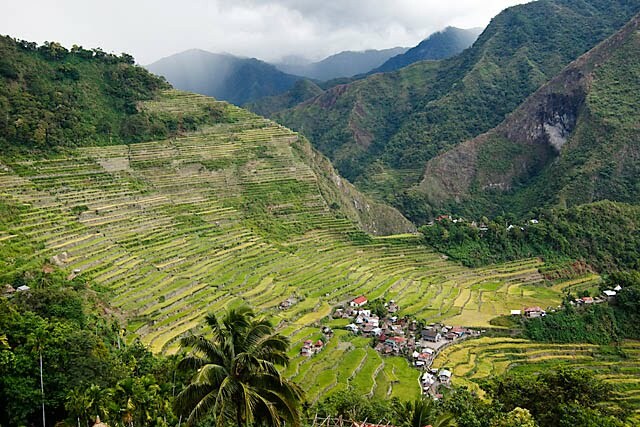 Besides being able to take walks through the village and the rice terrace at a more leisurely pace, staying in Batad also allows you to see the rice terraces during morning and evening hours. During those times, mists descending into the valley gives the place a otherworldly look, and it is no wonder that the Ifugaos call the rice terraces "Stairway to Heaven". 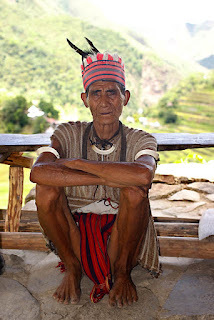 Getting to Batad does require some logistics though. Typically, you take a public jeepney from Banaue town to Batad Saddle, a mountain ridge, before taking a trek down to Batad village itself. However, these jeepneys operate only in the afternoon and if you take the overnight bus from Manila to Banaue, you find yourself in Banaue early morning. 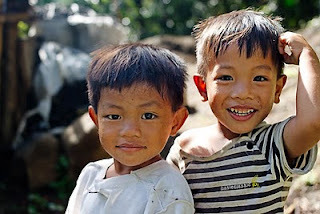 You could wait till afternoon, or you could take the tricycles or motorbikes to the Batad Junction, whereby you would have to trek uphill to the Batad Saddle yourself. The trek takes easily 60-90 minutes and its an uphill climb, so be mentally prepared. 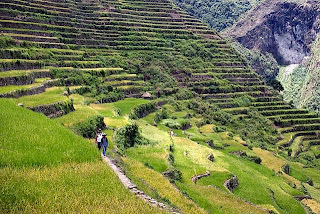 The trek from Saddle downhill to Batad is relatively easy. If you enjoy a quiet sojourn amidst a beautiful setting, go visit Batad and stay overnight!